I hope everyone is enjoying the change of seasons in your part of the world. Here in Indiana the weather has turned from scorching hot summer weather to crisp, cool fall weather. We have been near freezing several evenings this week. I guess it is October so it's to be expected. I feel like we went from 80 to 50 in a matter of a few days. I don't enjoy the cold, but I do love fall and winter and all of the holidays that come with it. 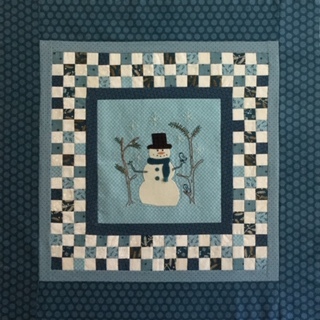 This is my newest pattern called Snow Time. The snowman, hat and scarf and wool, and the rest of the center is embroidered. I'll have it up in my Etsy shop and on Craftsy soon. 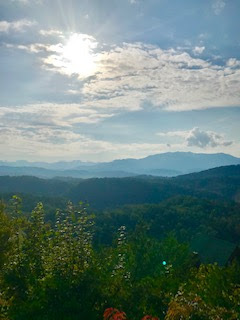 We were on vacation in the Smoky Mountains for about 10 days. While we were there I finished my last few Kingfisher blocks. I hand appliqued' them to the diamonds. I'm waiting for inspiration to strike to add the setting pieces and borders. There's a lot of color in those blocks, and it's hard to zero in on just one. Sharon M. and Linda B. met me at Back Door for show and tell, and then the 3 of us went to Portillos for lunch. I had only known these two ladies on-line before, but I had such fun with them that it was like we'd been friends for ages. I hope to get together with them again soon. I spent a few days down at Michele's in northern Kentucky a few weeks ago, and we really did sew. It was one of those times when we ate most of our meals at the sewing machine so we could get lots done. We finished our quilt from the June issue of American Patchwork & Quilting magazine. You can see part of Michele's quilt on the right. We ordered this little quilt pattern on line and whipped it up one evening. I had a big stack of these pink and brown log cabin blocks, and I was able to put some of them into a quilt top. Here's the view from the cabin where we stay in Tennessee. I think it's one of the most beautiful places on earth. I went over to Dayton, Ohio, on Friday to meet Michele, Barb and Meredith for lunch and to spend the afternoon at the One Stop Shop Hop. 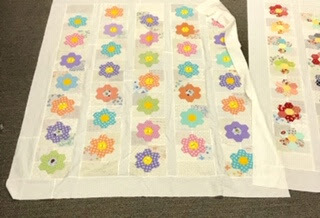 I spotted a quilt made from one of my patterns in the Sew Happy Quilting booth. Their shop is located over in Belpre, OH. 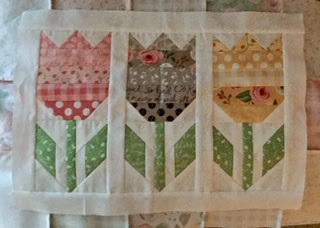 This is my leftovers pattern made by Sarah at Back Door Quilts. They had it displayed in their booth. I love how it looks in Kim Diehl fabrics. 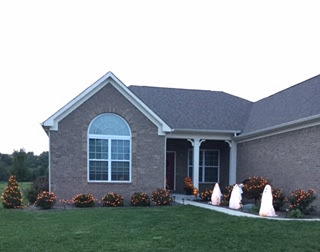 Yesterday we put the Halloween/fall decorations out front. My husband is a very handy guy and bored holes through these artificial pumpkins and put them on a dowel rod so they stay put and don't blow over. The ghosts are made from tomato cages turned upside down. I bend the wires at the top down and wind the cage with white lights. I use binder clips to clip the white fabric onto the cages. I've used permanent marker to draw faces on the ghosts.